With the growth in the number of creches, and preschool and afterschool childcare providers in Ireland, it’s more imprtant than ever to have an online web presence to promote your services and ensure your childcare business stands out from the crowd. Our user-friendly websites are easy to update and we offer a range of website tools as standard to help you communicate with parents and promote your childcare service. For a low fee, you could be the proud owner of a fantastic looking website which enhances your professional image and will help to attract new customers. 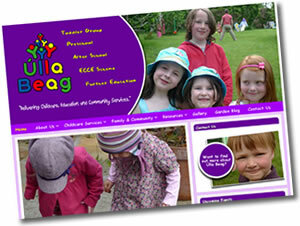 To arrange a visit from one of our web design team, contact us now on 0767 56670. The initial consultation is absolutely free and you will be under no obligation retain our services (unless of course you choose to do so).